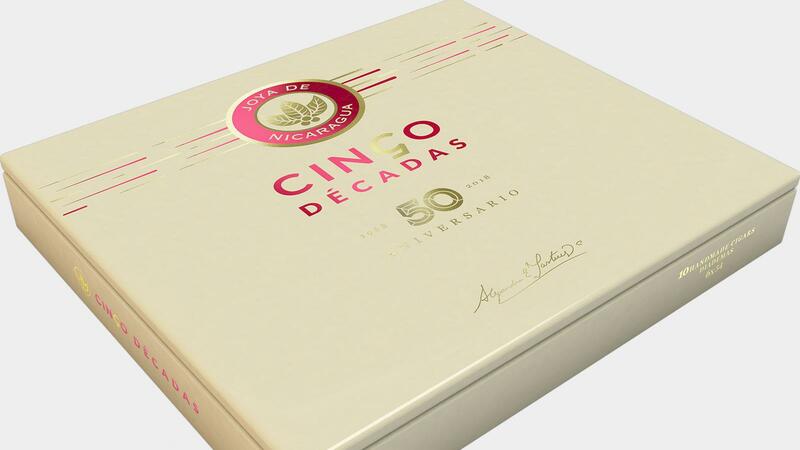 Joya de Nicaragua is now half a century old and to celebrate the landmark anniversary, the company is releasing a special cigar called Cinco Décadas. The new brand will debut at the International Premium Cigar & Pipe Retailers trade show on July 13. According to Joya, Cinco Décadas is a Nicaraguan puro rolled with some of the company’s best tobacco leaves. Cinco Décadas will launch in two sizes: a 7 inch by 50 ring gauge Churchill called El General and a 6 by 54 double-tapered figurado called Diadema. The cigars will retail for $19 to $20 dollars, respectively, and ship in 10-count boxes. Martínez says the company chose these vitolas because they were the most popular cigar sizes in the early years of the company. Cinco Décadas El General, top, measures 7 inches by 50 ring gauge, while the double-tapered figurado called Diadema, bottom, measures 6 inches by 54 ring gauge. Described as a medium- to full-bodied cigar, Cinco Décadas is rolled at the Joya de Nicaragua factory in Estelí, Nicaragua, and distributed by Drew Estate in the United States. The cigar will be available exclusively at Drew Diplomat retailers in the U.S. with limited availability internationally. According to the company, only 50,000 cigars will be made available (25,000 of each vitola) in the first year of release. “New sizes will be introduced on a limited basis in the following years,” Martínez said. Joya de Nicaragua Cinco Décadas will be on display at the IPCPR trade show later this month and is positioned to start shipping to retailers the first week of August. Read more about the history of Joya de Nicaragua in the August issue of Cigar Aficionado, on newsstands July 10.